Dr. Wininger received his Bachelors of Science degree in Biology from East Tennessee State University and his Masters in Biotechnology and Doctorate in Zoology from the University of Tennessee in Knoxville. 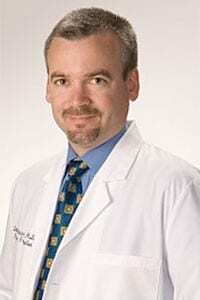 He is certified as a “High Complexity Laboratory Director,” by the American Association of Bioanalysts. Very few embryologists in the United States have achieved this certification, which requires extensive study and competency testing. Dr. Wininger served as the Scientific Director at Reproductive Biology Associates in Atlanta, GA from 1998-2003. He was responsible for directing the research and conducting many ground breaking clinical studies in reproductive endocrinology and infertility. He also expanded his experience performing IVF and associated procedures such as ICSI, assisted hatching, and preimplantation genetic diagnosis. Dr. Wininger will be performing PGD for genetic disease screening. Dr. Wininger served as the Director of IVF and the Director of the IVF Laboratory at the Toll Center for Reproductive Sciences at Abington Memorial Hospital in Abington, PA from 1993-1998. Prior to joining Atlantic, Dr. Wininger served as Assistant Professor, Department of Obstetrics and Gynecology, Wake Forest University School of Medicine. He worked closely with Dr. Deaton to offer all advanced reproductive technologies. His decision to join Atlantic was partly based on his desire to work more closely with patients, which is an opportunity afforded by private practice. As part of his work with patients, he’s able to help the practice answer questions about “bad eggs,” fertility and reproductive health. Dr. Wininger’s experience in Reproductive Endocrinology/Infertility spans more than eighteen years. He is the primary, or a contributing author, of fourteen journal abstracts and five journal articles. His work includes extended embryo culturing and blastocyst transfer. He has also done pioneer work in the freezing and thawing of human eggs. The ability to successfully cryopreserve oocytes will allow women to save their eggs while young for use in the future. He held numerous academic appointments including Adjunct Research Associate, Department of Biology, University of PA, Adjunct Instructor Department of Obstetrics and Gynecology and Reproductive Sciences, Temple University School of Medicine, Philadelphia, PA. He is a member of the American Society for Reproductive Medicine, the American Association of Bioanalysts and the American Association of Tissue Banks Dr. Wininger also serves on the Executive Council of the Society for Assisted Reproductive Technology.